Australian rugby is mourning the death of trailblazer Lloyd McDermott, who has died at his Sydney home aged 79. McDermott, who was the first Indigenous Australian to become a barrister and one of the first to play for the Wallabies, famously made a stand against apartheid in South Africa by making himself unavailable for the national team’s 1963 tour of the country. “The rugby community is deeply saddened by the news of Lloyd’s passing, however, his impact on the sport will never be lost and his name will never fade. He was an extraordinary man,” Rugby Australia chief executive officer Raelene Castle said. A proud Aboriginal Mununjali and Waka Waka man, McDermott was born in Eidsvold in central north Queensland. The son of a farm labourer, his academic and sporting prowess from a young age won him a scholarship to Brisbane’s prestigious Anglican Church Grammar School. A 100-yard and 220-yards sprint champion on the athletics track at ‘Churchie’, McDermott’s flashing speed gave him an affinity with rugby and he played three seasons in the school’s first XV. The winger possessed electrifying pace and a blinding swerve, and graduated from the GPS representative team to play two Tests for Australia, his debut against the All Blacks in 1962. McDermott sensationally ended his association with rugby union as a player before the 1963 tour to South Africa. In declaring himself unavailable for the tour, he made his pride in his Aboriginality clear by opting not to play as an “honorary white”, which was the only basis on which he could compete against the all-white Springboks team under the country’s apartheid regime. After graduating in law, he worked in the Commonwealth Deputy Crown Solicitor’s Office before being admitted as a barrister in 1972. McDermott went on to establish the Lloyd McDermott Rugby Development Team with a mission to increase Aboriginal and Torres Strait Islander participation in rugby union. 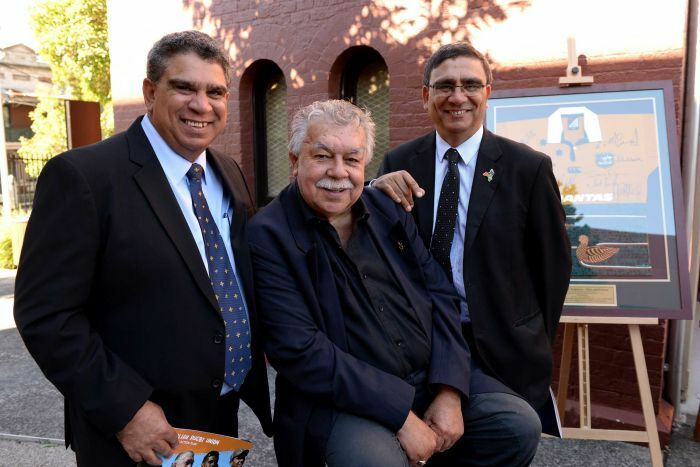 “Lloyd will be sorely missed by the Aboriginal and Torres Strait Islander communities,” Gary Ella, retired Wallabies centre and president of the Lloyd McDermott Rugby Development Team, said. “His legacy is not just his work in promoting sport to young people it is also about equality in opportunities for young people. The Australian men’s rugby sevens team paid their respects to McDermott by wearing black armbands at the Hong Kong leg of the World Rugby Sevens Series on Sunday.